This early 1900's house was compulsorily acquired by the State Government and will be bulldozed sometime in May 2016 so that the land can be used as part of a construction compound for a road/tunnel project. Heritage items have been removed to "safe storage" (whatever THAT means). The light fixtures look as if they'll go down with the building. Exactly what it says. They have been moved out of the house to somewhere safe. I hope they haven't finished removing all the "heritage" stuff. The fixtures have yet to be removed. They aren't going to remove them. When they say that they are removing everything of "heritage", "going through with a fine tooth comb", etc. light fixtures never fall into that category. Ceiling fans sometimes do, but I have never seen lights get saved by someone other than a lighting collector. What's wrong with the building oter than being in the pocket of a fat cat? Probably nothing wrong with the building. It's a shame to see nice old classic houses being removed for "progress". Exactly. There are lots of nice old buildings with nothing wrong with them around here being bulldozed all the time for "progress". There is nothing wrong with the building, it just happens to be in the way of "progress". The suburb this house is in is a so called Heritage suburb. The owners are not even allowed to paint them in in their own choice of colours. It has to be an approved colour scheme yet the government can just lift the heritage status to do their dirty deed then place it back on again when finished. What gets up my nose is that this house and the one to the left and opposite are not in the way of the road project. They just need the land to set up the construction compound and once finished will probably sell the land to some greedy developer. It is one of approximately 70 houses in the area that are being demolished for the road/tunnel project. The house to the left of this one has already been flattened, and two opposite will go. The original owners were not allowed to take any items that were attached to the building. I know this from talking to one of the other affected people. Heritage items removed to safe storage... I suppose to be eventually sold off. More profit for the government. Back to the status of the light fixtures, to me the only vintage looking one is the lantern above the front steps. The others look to be more 70's/80's. The owners are not even allowed to paint them in in their own choice of colours. Any new neighborhood (and many not-so-new too) have covenants for paint colors like that. 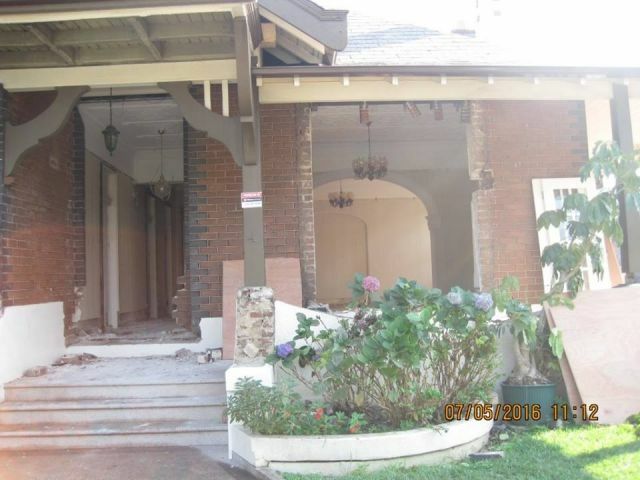 As for people demo'ing crappy old houses/buildings: my feeling is "good riddance"
This is called expropriation. It is when a government department forcibly acquires a property to use for its own projects. A controlled access highway was built here in the 1980's. They expropriated a house, but subsequently never demolished it as it was far enough from the project. The owners had built another house far away (but in the same community) and their original house was then sold to a senior citizen's organization. Although laws vary from country to country, usually there is a mechanism to prevent unneeded expropriation. The owners are not simply stripped of their property ; the government buys it from them although I don't really know who sets the price and all that. Well, something similar happened here. They are building these hideous "modern" apartment buildings literally 6 feet away from a main road. In the process, they expropriated a small privately owned vet clinic. At least 6 people lost their jobs, and they just demolished the building. Now in it's place is a hideous large apartment building with a foundation less than 6 feet away from the main road, and all it takes is for some bad traffic accident and the whole building is probably going to collapse. Although this has strayed off-topic, this may give a better insight on compulsory acquisition of a property here in New South Wales. I'd hate to be forced out of my own home like that. I do wonder what the kind of globes these fittings has seen over the years, and wonder what the powerpoints and switches are. I bet they are some real nice classic HPM and Ringgrip ones there. @Mercurylamps: Protestors against the tunnel project staged a "sleep-in" in that house one night (before the windows and doors had been removed). Interior photos show pull-cord light switches in the old part of the house. The globes would have originally been incandescent but possibly energy-saving types have crept in, in more recent times.